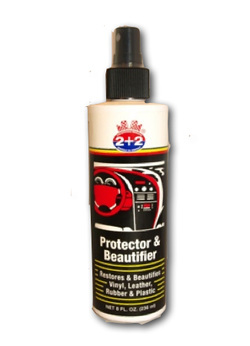 BERKEBILE 2+2® PROTECTOR & BEAUTIFIER... is designed to restore the natural beauty of old, worn out vinyl, leather, rubber, and plastic surfaces, as well as protect them from future damage! 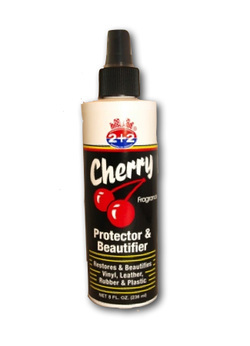 BERKEBILE 2+2® PROTECTOR & BEAUTIFIER also comes in cherry fragrance! SAFE, NON-FLAMMABLE, NON-CORROSIVE, AND NON-TOXIC! RESTORES & BEAUTIFIES VINYL, LEATHER, RUBBER, AND PLASTIC SURFACES! PROTECTS AGAINST DULLING, ROTTING, CRACKING, AND HARDENING OF SURFACES! FOR USE ON AUTO DASHES, TIRES, LEATHER AND MANY OTHER HOUSEHOLD PRODUCTS! Spray BERKEBILE 2+2® PROTECTOR & BEAUTIFIER on a clean surface and wipe evenly with a soft cloth. Allow to penetrate. Buff surface with a soft cloth. repeat process for additional protection. Reapply periodically.